On Friday, March 22, the three Loveland recipients from this past summer shared slide show presentations of their trips with the rest of the faculty and staff. Veteran biology teacher, Patty Agoff, was first to present. She went to Rio de Janeiro, where she was able to observe some of the world's most diverse and rare animal species and to visit her daughter and grandchildren who now live there. She showed us pictures of alligators, capybaras, and piranhas. Her husband even conducted a mini-scientific experiment to find out if piranhas really do bite. Turns out they do! He learned this after sacrificing his own hand to the piranhas for the sake of knowledge--a true scientist at heart. Next up was English teacher, Emily Fawcett, who went to Norway. Ms. Faucett shared stunning pictures of fjords, breathtaking glaciers, and some pretty zany artwork. She spoke about how her trip was an example of using the Fellowship as a means for personal growth rather than scholastic enrichment. She spent her time challenging herself physically and mentally in a foreign country and came back refreshed and rejuvenated with a perspective she would not have otherwise had. The last presenter was English teacher, Kate Tomatis. 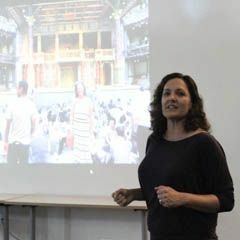 A Shakespeare scholar by trade, Ms. Tomatis had the pleasure of going to England and Ireland to steep herself in the theater. She saw plays at the National, Olde Globe, and Abbey Theatres. Oh, and her family came along for the ride! She went to several museums, most notably the Theatre History museum in England where she had a chance encounter with a special letter that was on display from Elia Kazan to Vivien Leigh. In the letter, Kazan assures Leigh that with the help of a very trusted costume designer, the filmed version of A Streetcar Named Desire would be a success. Turns out that that trusted cosutme designer was none other than Ms. Tomatis' aunt.